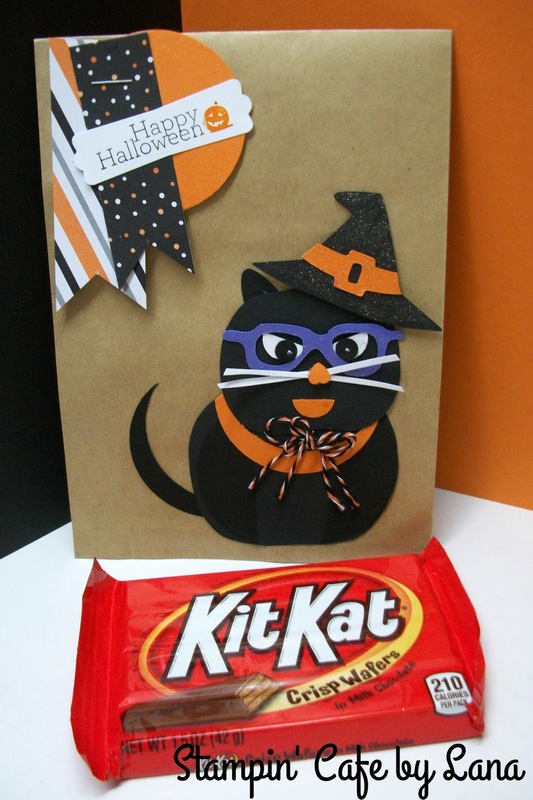 Do you need treat bags or cute little treat holders for classroom treats or for trick-or-treaters? Here are some I made. The bag above is a 4-1/2 x 7-3/4 flat brown bag you can get at Hobby Lobby. Cuts for the black cat body are made with 2 pumpkin cuts from Create a Critter2 cartridge, p. 54, cut on the shadow setting, at 3" and 2-1/2". The hat is from the same CAC2 cartridge on p. 53, cut at 3 inches. The hat band is cut in orange, also at 3 inches. I added Wink of Stella to both the hat and the band to make it stand out a little from the black cat. I also added dimensionals behind the hat. Trim off the top stem and leaves of the pumpkins and save two of the leaves for the ears of the cat. Attach behind the smaller pumpkin. Attach the smaller pumpkin with ears (the head) slightly offset to the right onto the larger pumpkin (the cat body). I punched out a 2 inch circle in black, cutting off the edges (not quite cutting the circle in half), for the cat's haunches, and another 2 inch circle in orange, trimming off just the rim to use for the cat's collar. I did the same thing for the cat's tail, cutting it from a black 2 inch circle. The eyes are 1/2 inch circles in white, cut in half, and the pupils are 1/4 inch circles, adding a dot of white ink to the centers. The purple glasses are from Everyday Paper Dolls, p. 37. I added Wink of Stella to give them some pizzaz! The mouth is a 1/2 inch orange circle cut in half. Whiskers are thin strips of white cardstock. The nose is a small heart punch. I tied a bow with some orange and black baker's twine and attached it to the collar. The flags attached at the upper lefthand corner are hand cut from Stampin' Up's Halloween Night Designer Series Paper. I added a punched out 2 inch orange circle behind the flags. 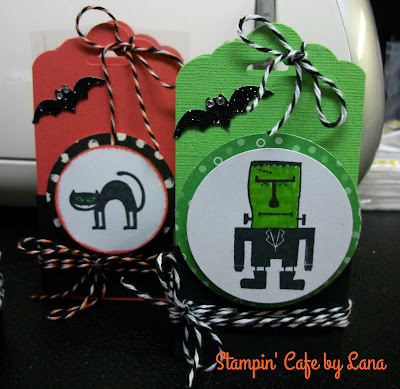 The Halloween greeting is from Delightful Dozen, a retired Stampin' Up set, punched with a retired label punch. These bags will hold full size candy bars like Kit Kats, etc. If you want a simpler and smaller treat holder, here are some I made using directions from Julie Davison, Stampin' Up Demonstrator. She has a video on You-Tube. Click here to see her video. 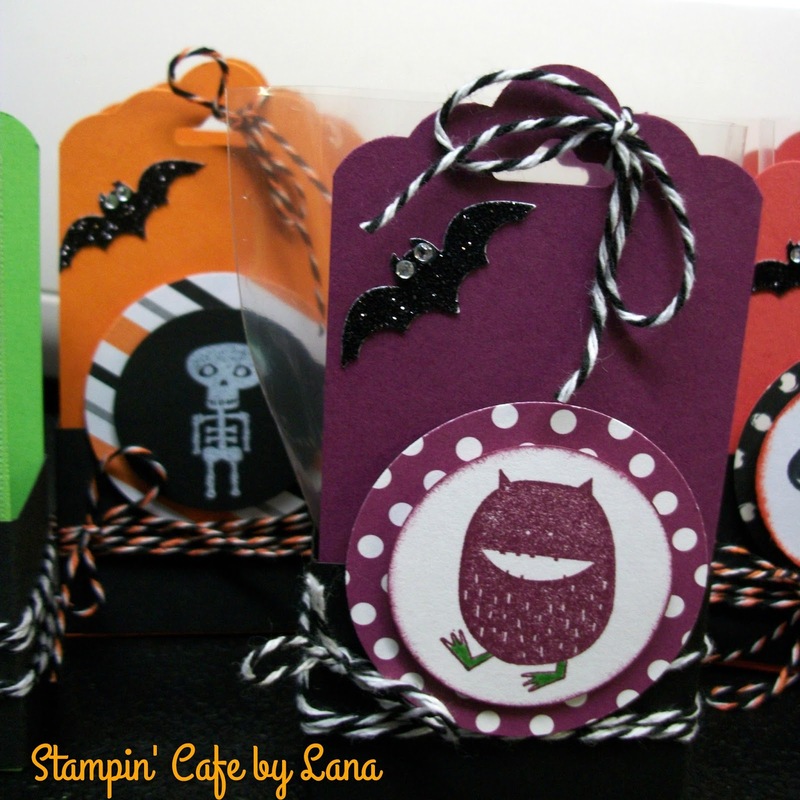 These are made with a 2 x 9 inch piece of cardstock, scored at 4" and 5", and the ends are scalloped using the Scallop Tag Topper punch from Stampin' Up. The black band that holds it together is cut at 1-1/2 x 6-1/2 inches and is scored at 2", 3", 5" and 6", Secure the band with tear and tape and insert over the top of your scored and folded large tag piece. I used a little bit of glue to hold the back of the band onto the tag to give it more stability. I used the retired Freaky Friends stamp set from Stampin' Up in various colors, punched them out with whatever circle punch fit around the image, and then punched out a larger circle to add behind it, using various scraps of patterned paper. I then attached the circles to the front of the holders using dimensionals. I added some little sparkly bats I got at Hobby Lobby and tied the tops with some black and white baker's twine. These little treat holders will hold the individually wrapped fun size candies or candy bars.I think they would make cute treats for co-workers too! If you would like to see a photo of all these treat holders lined up, they are featured on my Facebook cover page. Come by and visit sometime!